Major Announcement: New Black Fish Cycling Kit! Ladies & Gentleman, the wait is finally over. 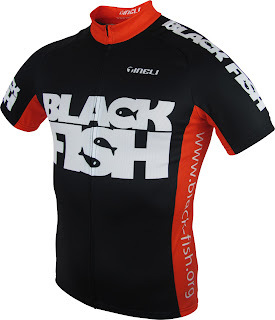 The mighty Black Fish Cycling team today unveiled its 2011-12 official team kit. In a major overhaul of the team design since the switch in focus from elite basketball to elite cycling, the new gear features the spectacular new logo and a splash of fiery red, but maintains the emphasis on the menacing black that characterizes the team. The kit, including jerseys & shorts (pictured below), caps, and arm warmers & leg warmers (we highly value the warmth of our peripheries around here) has been designed and supplied by the magnificent team at Tineli. In a first for this website, I would like to give an unreserved and genuine endorsement to Jono and the rest of the gang at Tineli, who have turned a back-of-the-envelope design into the awesome gear that will, from this day on, be seen climbing Lofty at record speed. Future posts will include more images of the gear, as modeled by your favourite Black Fish cyclists (please send your modeling requests to admin@black-fish.org). With only 54 days to go until the 2012 Tour Down Under, the mighty Black Fish cycling juggernaut has begun to step up the training intensity. After a grueling sufferfest during the week, hardened riders Weeks, Whittle and Edwards set out for a rapid leg-burner on the time-honoured Deviation Road route (see training map below). So professional were the riders that they were able to ignore the ravages of the sunny, 27-degree, wind-free conditions. All three riders showed outstanding form, and were so far ahead of their expected pace that they stopped for some publicity shots along the way. These photos are for you, Black Fish fans, because we love you. 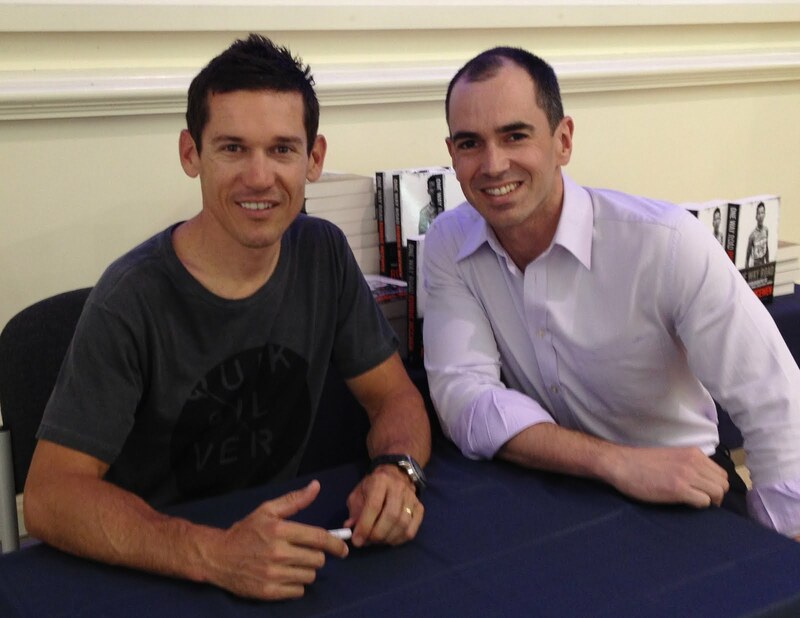 Rumour: Robbie McEwen to leave GreenEDGE for Black Fish? In one of the hottest rumours on the international cycling circuit this year, speculation is mounting that cycling great Robbie McEwen is in active talks to defer taking up his position with GreenEDGE in order to seek further cycling glory with the mighty Black Fish. Many believe that McEwen, winner of the 2002, 2004 & 2006 Tour de France Green Jersey, would be the perfect fit for the Fish, whose fabled train (and the unparalleled lead-out capability of team leader Sam Whittle) would have little difficulty in depositing the legendary sprinter at the front of the peloton in any level of competition. It remains unclear whether McEwen, 39 (pictured below with Whittle), would be willing to commit to the rigours of weekly Thursday night 'Dicky Spin' sessions, rather than opt for the more leisurely training regimen of World Tour contenders GreenEDGE. In a moment that can only have stirred the loins of Black Fish fans everywhere, the magnificently menacing BF cycling quartet of Edwards, Rodgers, Weeks and Whittle were reunited on the road in the final training ride before Amy's Ride. And it was a day replete with both novelty and routine: it was the team's first reconnoitre of a part of the 2012 TDU route, the first Black Fish assault on Anstey's Hill, and this is the first BF blog post to include both a route map and a training video. The routine part, however, was the precision with which the fabled Black Fish train locked together at every opportunity to create an emergent whole that was truly greater than the sum of its parts. The map below can show you the route and the elevation, but it can't describe to you the transcendent glory of four fine men and their bikes, a multipartite chimera of muscle and machine, as they cleaved the early morning air like gods, intent on banishing mortal laws of gravity. Plus we ate some jelly beans, which was good.